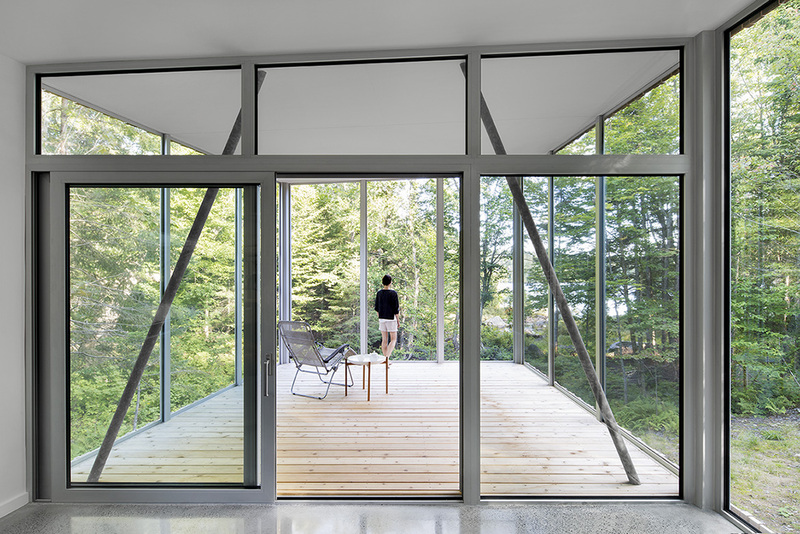 The house on Lac Grenier, due north of Montréal, was conceived (as all good Canadian cottages should be) as literally a natural extension of the landscape. 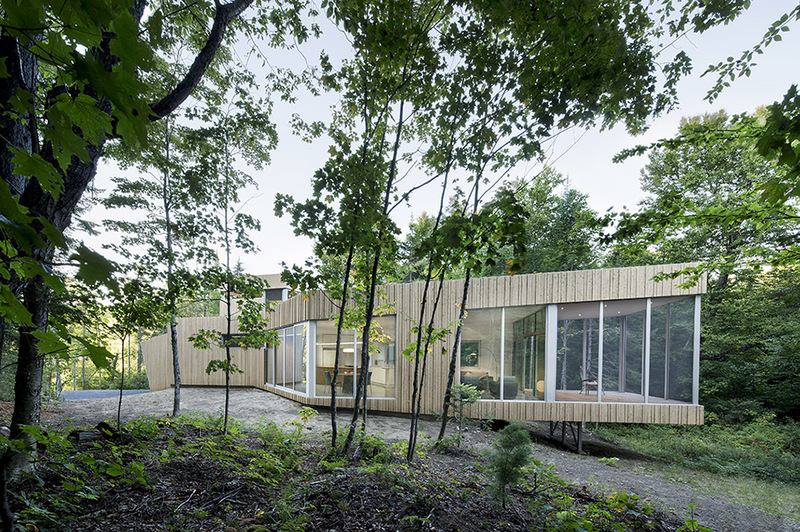 Situated 15 metres from the lake’s shoreline, isolated from its neighbours and screened by native growth, the structure is surrounded by forest and backed by a meandering stream. 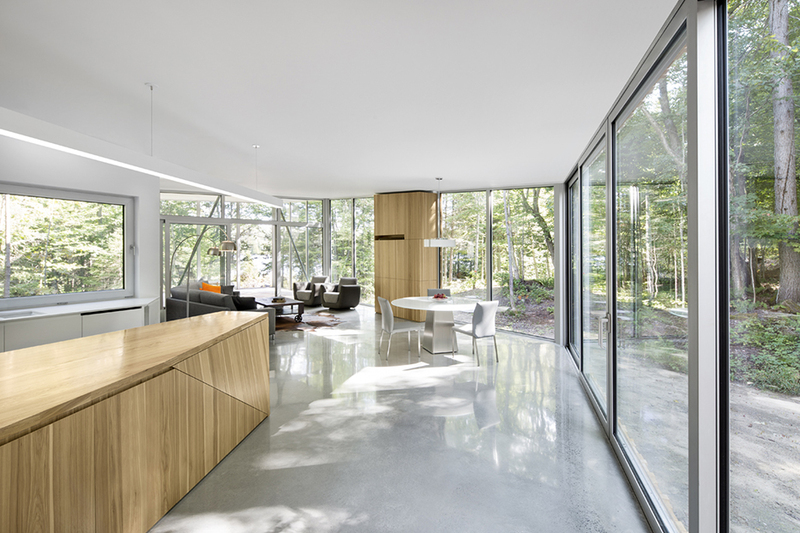 Montréal architect Paul Bernier took his cues from this stream, conceiving a mostly one-storey, serpentine abode that carves its own path through the site. His nature-loving clients, a pre-retirement couple looking for a weekend retreat that eventually would become their full-time home, fully approved of this approach, and of the decision to cut down as few trees as possible. The slope of the land and the positioning of the restricted lake view also dictated the building’s elongated shape. These results comprise a house built palisade-style out of varying widths and thicknesses of semi-permeable cedar siding. The boards’ open-work conceals the necessary functionality of weatherproofing, flashings and drip edges, presenting the viewer with a clean, unfussy appearance. Better yet, “architecture and nature will intermingle,” says Bernier. Already the glazed great room and cantilevered porch act as mirrors, reflecting the woods about them. 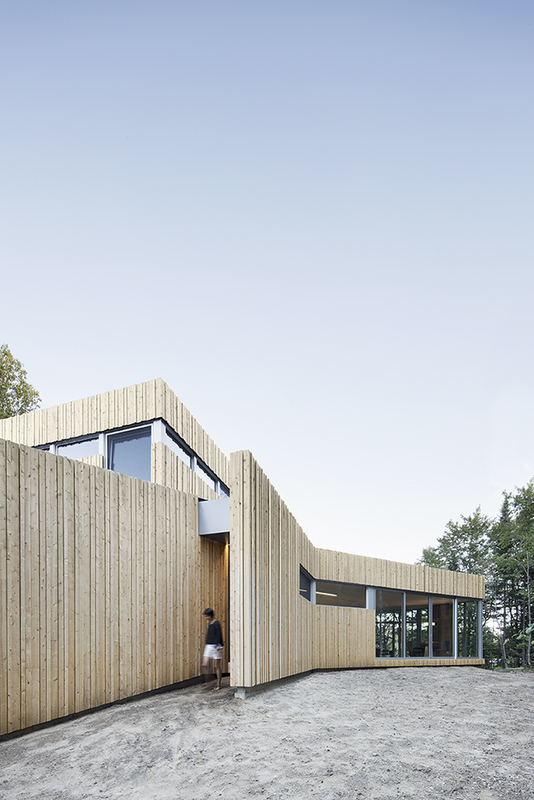 Over time, the cedar siding will grey out, blending into the adjacent treeline. Within a year or two, native plantings will reach ground cover status around the building, further obfuscating it. Best of all, a green rooftop — visible only from home’s raised “tree fort” study and a nearby hill — will become a riot of wildflowers and ferns. Spare furnishings, minimal detailing and a neutral colour scheme allow the eye to focus on the great outdoors through generous glazed windows and walls of the living area and porch beyond. Inside, the winterized cottage contains two small, functional bedrooms and baths, in addition to the upstairs study that could also be used as a third bedroom. Here and elsewhere — over the kitchen sink, for instance — generously sized windows act as frames for unique views. Open them and the scents and sounds of forest, stream and lake waft through the house, making it even more part of the landscape. But it is the main living area the house really centres around. Three large geometric volumes in hickory wood lead visitors from the entryway storage through to the kitchen island and an integrated wall unit beyond, drawing them towards the main room and porch’s panoramic view. Simple, sparse materials and furnishings, neutral white walls and a polished concrete floor allow nothing to distract from the exterior beauty. There is not even a fireplace here; radiant flooring and hidden vents provide the heat. True, the one in the entry includes coat storage and a bench for putting on boots and shoes. But it also acts as a screen to the home’s more private areas. The island sits smack in the centre of the main room, as if emphasizing the kitchen’s social and familial importance. And the living room’s wall unit, playing vertical to the island’s horizontal, does more than house a TV and sound system. 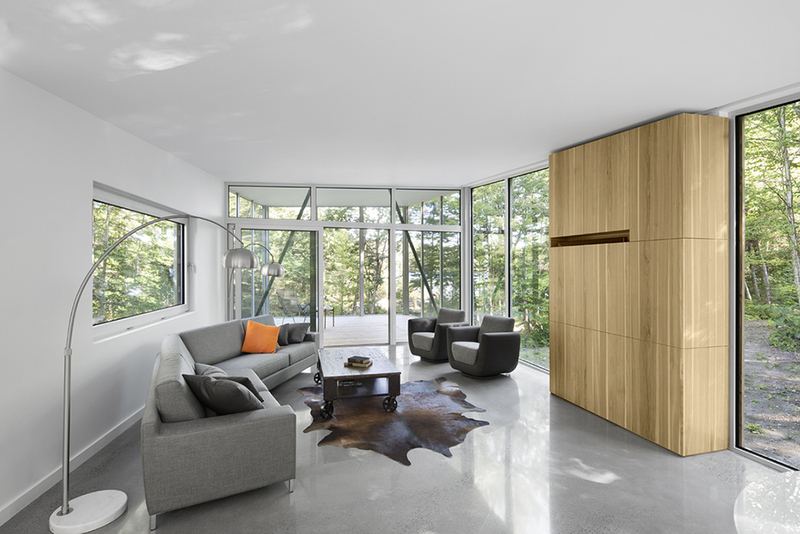 It visually braces the room and provides a solid counterpoint to the unstructured nature on all sides. Each piece is sculptural, providing an artistic axis to the interior. 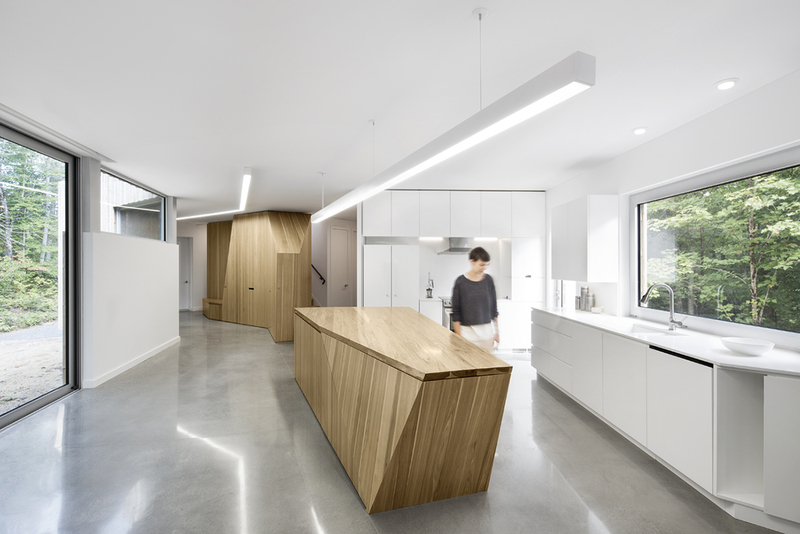 And, together with the angled strips of LED lights overhead, they echo the house’s own serpentine shape. 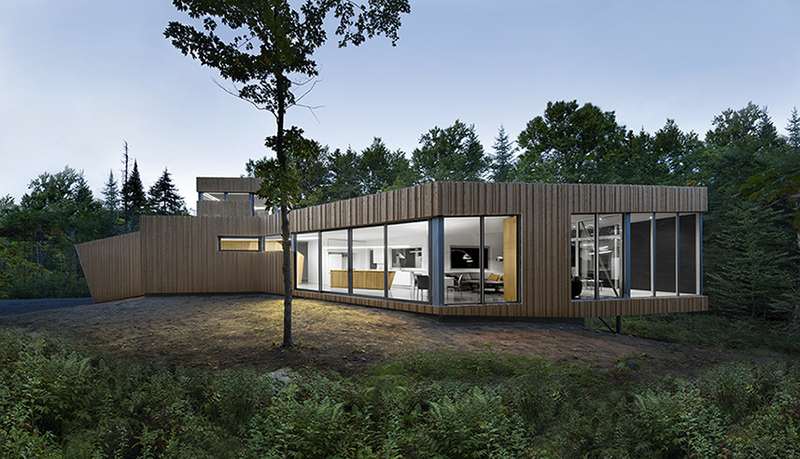 With time, as Lac Grenier home’s cedar slats will fade and the trees and ground cover will grow back around the building: architecture and nature will intermingle. The cottage at Lac Grenier provides an object lesson to all those who would live in the great Canadian wilderness. 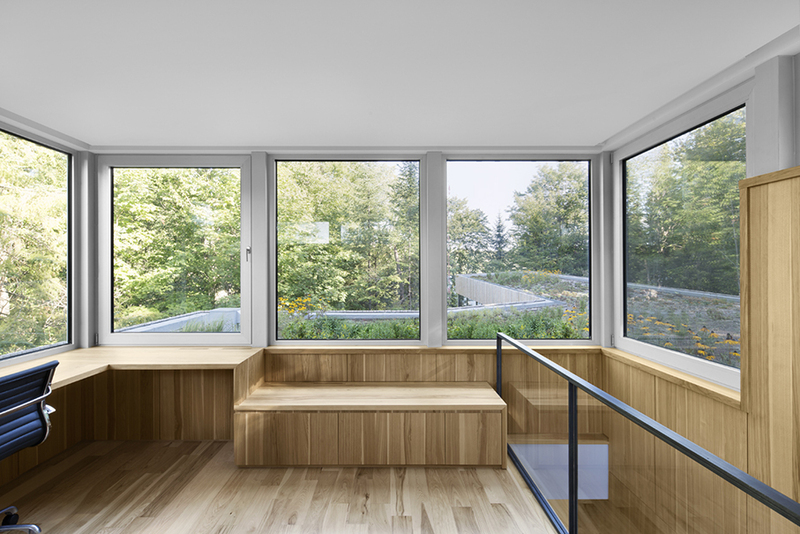 Rather than turning its back on nature, the house gives itself over to nature. Instead of relying on soaring ceilings, mammoth stone fireplaces and quaint decorative touches, it leaves the wow factor up to the genuine article.